If you dream of rich red soil, glowing sunsets and infinite spaces then The Spirit of the Outback is for you. 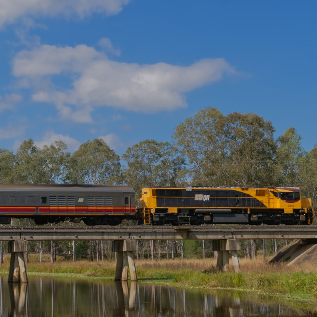 On its journey west from Brisbane, the Spirit of the Outback ventures through the heritage towns of Rockhampton, Blackwater, Emerald and Barcaldine before arriving in Longreach, home to the famous Australian Stockman's Hall of Fame, Qantas Founders Museum and the Outback Heritage Centre. Although the legendary town of Longreach marks the end of the line, from here there are coach connections to Winton and a host of surrounding attractions including the Historic Wellshot Hotel, Lark Quarry Dinosaur Footprints, Blackall's Historical Woolscour and Jacky Howe, the Australian Worker's Heritage Centre and the Waltzing Matilda Cultural Centre. The Spirit of the Outback travels twice a week in either direction offering a unique insight into the history and culture of early Australia. While it may be tough and dry outside, the air conditioned Spirit of the Outback has every amenity to make your journey totally comfortable. The dining car serves hearty Aussie meals while the bar and lounge are perfect for a relaxing drink with other fellow adventurers. Reclining Seats are in open saloon cars with an overhead luggage rack, individual reading lights, panoramic windows, toilets and washbasins at the end of each carriage. Triple Sleepers feature three berths converting to seats during the day with a washbasin, reading lights and a power point. A blanket, lower sheet, pillow and pillow slip is also provided for each passenger with showers and toilets available at the end of each carriage. Twin Sleepers (Twinettes) feature a washbasin, wardrobe, reading lights and a power point with bedding and towels provided. The berths convert to seats during the day with showers and toilets available at the end of each carriage. Single Sleepers (Roomettes) feature a washbasin, wardrobe, reading lights and a power point with bedding and towels also provided. The berths convert to seats during the day with showers and toilets available at the end of each carriage. To for further information or to book any Rail Australia journey please do not hesitate to contact us.